In the US, over 6 million children had ongoing asthma in 2016. Globally, asthma kills around 1,000 people every day – and its prevalence is rising. This condition has a high economic cost. Each year in the US, more than $80 billion is lost because of asthma. This is mainly due to premature deaths, medical payments and missed work and school days. The burden is higher for families with asthmatic children, who, on average, spend $1,700 more on health care than families with healthy children. 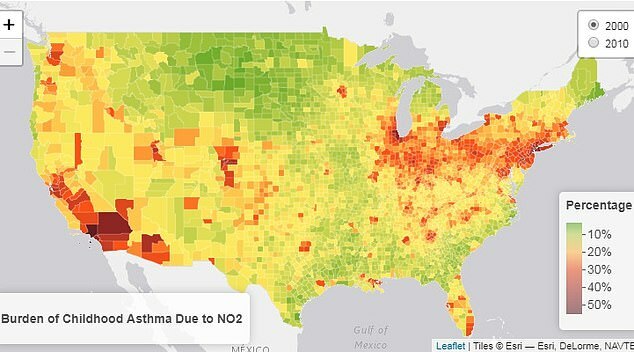 In our study, published on April 3, our team mapped where in the US children are most at risk for developing asthma from this type of pollution. We then took data extracted from surveys by the Centers for Disease Control and Prevention, estimating childhood asthma incidence in the US. Alongside data from our air pollution models, we used these data to estimate the number of childhood asthma cases caused by exposure to traffic pollution. Our analysis found that childhood asthma cases attributable to traffic pollution across the US decreased, on average, by 33 percent between 2000 and 2010. In 2000, we estimated that 209,100 childhood asthma cases could be attributed to traffic pollution, while this number dropped to 141,900 cases in 2010. That’s a major win for public health. 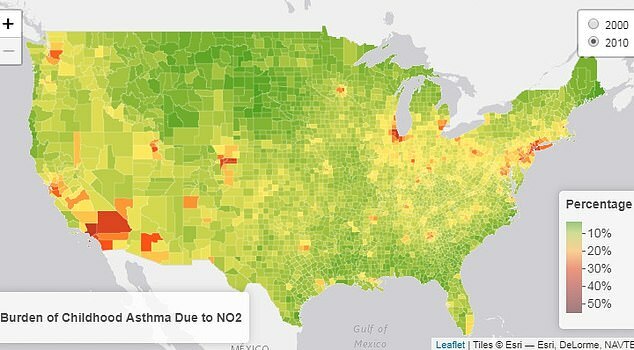 Despite this encouraging decrease in air pollution and its associated health burden, there were 141,900 childhood asthma cases due to traffic-related air pollution in the US. That’s 18 percent of all childhood asthma cases.